Our young U23s bowed out of the Kent Senior Cup losing 3-1 to National League Bromley at Hayes Lane on Tuesday night. Despite having most of the play in the first half, the score remained at 0-0. Charlton had three good chances to take the lead but were denied either by poor finishing or good saves from the home side’s keeper. 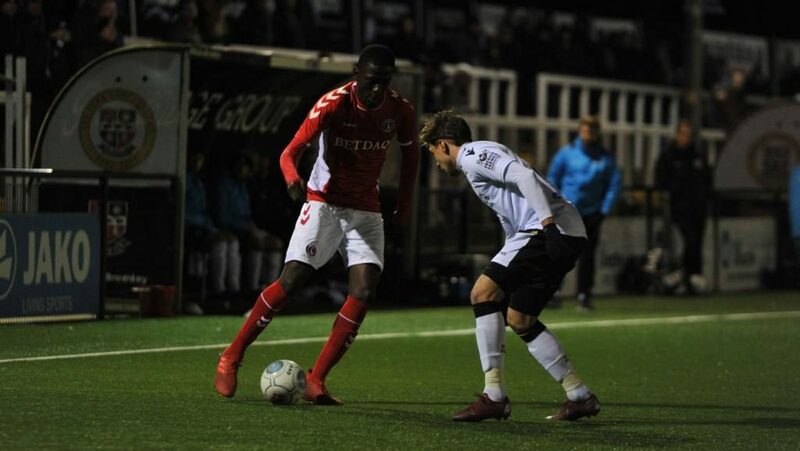 Just after half time, Charlton did take the lead when Brendan Sarpong-Wiredu scored from a very acute angle after being put through by Taylor Maloney. Play was open after this with both sides cancelling each other out until the 73rd minute. A poor clearance went to a Bromley forward who passed to his strike partner who equalised. Bromley scored two further goals, one from the penalty spot and another with a one on one with the goalkeeper. From being well in control of the game we lost 3-1 with one of the quickest hat-tricks ever seen. Let’s hope this result doesn’t affect the team too much as they are next in action on Monday, 21st January at Greenwich Borough’s ground against Sunderland (Kick-off 7 pm). Charlton U23s: Maynard-Brewer, Cummings, Bowry, French (Mascoll 87), Scott, Maloney, Sarpong-Wiredu, Dempsey, Hackett-Fairchild, Aouachria (Carey 69), Doughty (Ocran 87). Subs (not used): Ibrahim, Vennings. Bromley: Gregory, Sutherland (Raymond 46), Johnson, Bugiel, Mekki (Craske 46), Dunne, Goodman, Meekums, Enver (Da Silva 67), Kalala, Hooper. Subs (not used): Thomas, Krasniqi.